There is much we can agree upon: The media landscape is constantly changing. It is here to stay. And, in the midst of increasing digital immersion, we want to raise happy, healthy kids. So how can parents, educators, and healthcare providers help children become masters of media? Before Facebook, Instagram, Twitter, or tablets were embedded in children’s lives, Boston Children’s Hospital Center on Media and Child Health (CMCH) was founded—an academic center dedicated to rigorously studying the effects of media on children’s physical, mental, and social health. CMCH’s research brings scientific evidence to bear on a dialogue that too often devolves into emotion-driven opinion and hyperbole. CMCH.tv is the go-to resource center for parents, clinicians, national press, and researchers. Under the leadership of Michael Rich, MD, MPH, the Center on Media and Child Health empowers children and those who care for them to create and consume media in healthy, safe, and productive ways. Greater TV viewing and cell phone use, specifically texting, is associated with increased symptoms of depression among adolescents (International Journal of Public Health, February 2015). What is the link between texting and depression? Dr. Bickham was awarded a Career Development Grant by Boston Children’s to answer that question. Some teens text embarrassing, even harmful images. Others post troubling social media messages. How can parents, educators, and healthcare providers best ensure youth respect safe, healthy boundaries? With a grant from the Digital Trust Fund, CMCH is reviewing and compiling evidence on effective strategies to change unhealthy behaviors. The results will be used to design online programs to teach children and teens safe internet use. As we shared with you last year, CMCH has formed a partnership with researchers at the University of Alberta and with the Alberta Teachers’ Association to conduct a longitudinal study across the province. The study will enroll 3,000 children (1,000 each in preschool, elementary, and high school) and track their media exposure and a wide variety of health, educational, and wellbeing outcomes over time. More than 2,100 Alberta educators responded to the initial needs assessment. The survey revealed that while classroom learning was helped by digital technology, students’ increased use of personal technology was associated with decreased readiness to learn and increases in fatigue, anxiety, and distractibility. While we know the value of children’s play to their cognitive, social, and emotional development, the play environment for young children has changed dramatically with the introduction of digital toys. With the generous support of toy company Hasbro, CMCH is using Measuring Childhood Play Experience (MCPE), a modification of the MYME methodology, to launch a new study: #MorePlayToday, the first comprehensive longitudinal study to examine how different types of play influence children’s development over time. CMCH has reviewed existing studies on play and found that all research to date has addressed either traditional or digital play in isolation, while today’s children move seamlessly between them. In the coming years, researchers will use MCPE to observe children playing with traditional and digital toys in their real-life settings and will measure their behavior, language skills, and physical and cognitive outcomes to generate recommendations on play strategies that optimize children’s health and development. From the outset, CMCH has been committed to translating evidence into action and sharing its findings with all stakeholders—children, parents, educators, clinicians, researchers, policymakers, and media producers. They turn to CMCH for advice, to explore Mediatrics, CMCH’s database of peer-reviewed scientific studies from more than a dozen disciplines, and to learn about new methodology and research initiatives. Mediatrics serves as the foundation for CMCH outreach and education. It brings together across-discipline scholarship on how media use influences, in positive and negative ways, children’s health and development. Mediatrics is free, easily searchable, and accessible to academic, scientific, and lay audiences. In the two years since the Center launched its new website (CMCH.tv), page views are up 51 percent. Fittingly for a center studying media, it also has an active presence on Facebook, YouTube, Twitter, and Instagram. At CMCH’s online advice column, Ask the Mediatrician®, readers pose questions that range from a mother’s concern about her 14-year-old’s “smartphone addiction,” to how to cope with adult-content commercials during family programming. It continues to grow in popularity; page views have increased a dramatic 1193% since the fall of 2013. The site intermittently includes Media Moments anecdotes to foster communication among families on the many ways media intersects with children’s lives. Last year CMCH added one more feature: The Mediatrician Speaks, a monthly video in which Dr. Rich addresses common concerns such as healthy sleep schedules for children and stereotypes in the media. In addition, CMCH publishes Media Health Matters, a monthly e-newsletter for parents filled with timely, practical tips. CMCH outreach efforts are made possible through the generous support of Comcast. 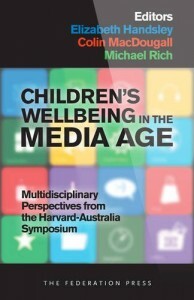 In the past year, CMCH researchers published in peer-reviewed journals, contributed chapters to textbooks, and edited a text, Children’s Wellbeing in the Media Age, published in Australia. Dr. Rich is frequently turned to for expert commentary by mainstream media such as The New York Times (August and November 2015) and The Atlantic (September 2015). In 2015, Drs. Rich and Bickham presented at several conferences, including the International Communication Association in Puerto Rico, and the Contemporary Pediatrics for the Healthcare Professional meeting in Kentucky, where Dr. Bickham gave the keynote address. In May, Dr. Rich keynoted the American Academy of Pediatrics’ first research symposium on media effects on child health, and in October was one of the featured speakers at “Digital Media and Developing Minds,” a conference co-sponsored by the National Academy of Sciences. To give even wider access to CMCH’s published papers and conference presentations, the CMCH Research Blog, with the most up-to-date information, goes out to researchers in the field. It includes all CMCH research, as well as other important findings from around the world. CMCH’s extensive digital presence is reinforced by on-site training and mentoring. Media effects on child health and development is an emerging field, one that CMCH is leading, helping define, and sharing with a national and international audience. The Center has hosted doctoral students from the United States, South America, Europe, and Asia. They spend up to a year with CMCH studying the team’s methodology and often generating important original research with our team. With the generous support of Harvard Pilgrim Health Care, the Clinician Toolkit was designed for busy healthcare professionals to integrate brief screening and anticipatory guidance on media use into their practices. Web-based, the Toolkit includes a video demonstrating how to use it; tip sheets, customized by topic and developmental stage, for both clinicians and parents; and patient surveys to gather constantly changing data on how media are used. CMCH has demonstrated and taught use of the ToolKit at the Contemporary Pediatrics conference and at primary care practices at Boston Children’s Hospital. In response to clinician feedback, the team currently is redesigning parent tip sheets to reflect best practices in health literacy and to ensure they will be accessible to a broad spectrum of the population. Today’s digital media has extraordinary capacity to enrich and simplify our lives. The internet brings a wealth of information, helps us find our way, connects us to loved ones across nations and continents, and enables us to express ourselves and benefit others. CMCH is passionate about empowering children and adolescents to make full, positive use of the media surrounding them. Social media can be more than just fun. It can be exceptionally beneficial to young people who share an illness experience. The intent of Children’s at Home (C@H) is to harness the power of social media to connect pediatric patients, build community, and share information and strategies for living with their disease—with the oversight of Boston Children’s medical experts. C@H is taking online connection, community, and crowdsourcing to another level for young patients who live with chronic diseases, such as cystic fibrosis, inflammatory bowel disease, or diabetes. Patients can post video, audio, or text narratives and respond to each other in a medically moderated environment that is dedicated solely to those who share their condition. C@H has sites for both patients and families that are linked but separated by a “semipermeable membrane” so that patients and families can choose to post information on one or both sides. “Our research has shown that patients undergo a role shift—from someone always in need of help to someone with experience and expertise living with a medical condition who can offer help to others. It has profound therapeutic power,” said Dr. Rich. Under his and Julie Polvinen’s leadership, the C@H pilot study has been completed for children diagnosed with neurofibromatosis Type 1 (NF1), a genetic disorder that puts patients at high risk of developing nervous system tumors. Adolescent patients from across New England made 170 videos capturing their experiences of living with NF1. Parents created 150 videos of their experiences and even more “response” videos than their children. CMCH is now piloting C@H for children with celiac disease, who live with a gluten-free diet. These pilot studies will guide CMCH to fine-tune C@H to optimize its value for patients and families. Children’s at Home is a key component of the hospital’s commitment to provide a continuum of care, and our goal is to have it in place for at least two patient groups in the coming year. CMCH is continually seeking ways to better understand how children use media and how it affects their health. 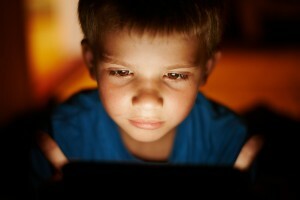 For the foreseeable future, digital media will become more essential and integrated into children’s lives. CMCH researchers build on what they learn from their investigations and translate that knowledge into tools and strategies for parents, teachers, clinicians, and the children themselves to optimize their media use and their health. 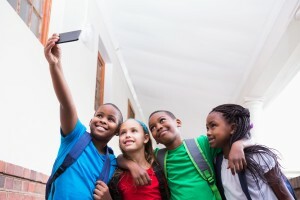 Roll out the MYME methodology to 3,000 preschoolers through adolescents in Alberta, Canada, collecting media exposures, health outcomes, and DNA samples to document epigenetic effects of media use. Redesign and streamline Mediatrics so users can seamlessly access it from any platform or device, search for research studies, export citations, and receive updates when new studies are added. Finalize a chapter on using electronic media as an effective tool with preschool children for an education textbook from Harvard University Press. This represents one of the Center’s first broad efforts to help educators use technology effectively. Establish a dialogue with a cross-section of parents who use Ask the Mediatrician. Do our answers and advice help? Does social media provide a useful and effective “online village square” for extended discussions and crowdsourcing of issues and strategies for digital parents? Build on the demonstrated value of Children’s at Home for young people with chronic illness and their families by rolling out C@H condition by condition, building communities of patients with shared illness experience to connect, support, and mentor each other. You, our philanthropic partner, make so much of our work possible. Your interest, commitment, and generosity inspire us. Deep thanks for caring so deeply about children and their lives as digital natives.